What ingredients go into our trading decisions? Opinions we hear in the financial media? Technical indicators that draw colorful lines on our screen? The latest forward “guidance” issued by the central bank? The next full moon or Jupiter in Leo? The AAII sentiment survey numbers? The stock picks we see on scutify.com? The Elliott wave count? Kayla Tausche’s smile? The geopolitical ebb and flow? Seasonal tendencies? “Garbage in garbage out” is a saying that originates from computer programming, but it also applies to trading. More on that after our weekly look at the market. 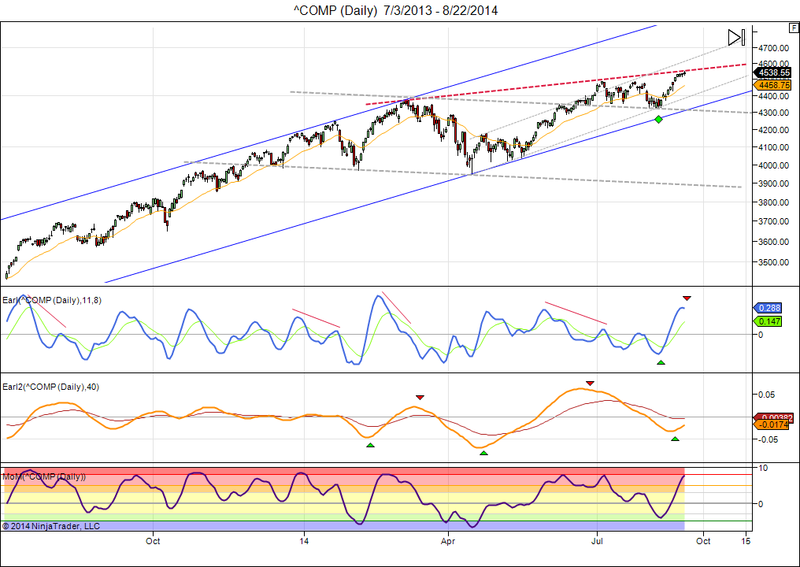 The markets have been kind to my latest forecasts for Nasdaq and have climbed straight to the 4530 target. See: Setting up for an August peak and Bending but not Breaking. But let’s not get carried away. Markets being markets: pat yourself on the back for good results and the next thing the market gives you is a good slap in the face. Last week’s results are of no help in the next. The confidence gathered in week 1 can become a trader’s undoing in week 2. That’s in the nature of the beast we call a stock market. But you knew that already, isn’t it? So, here we are at 4530. The Nasdaq is bumping into an overhead trend line. The lunar Green period is set to end later this week. Sell quick? Hmmm, maybe. Technically my Earl indicator is just turning down, suggesting some kind of pullback is up next. And the MoM is reaching a very optimistic +8 level, the kind of stuff that has made for peaks in the past. * Sunspot cycles have not shown any consistent effect in the market, as you can see in my earlier article and in this study: Sunspot Cycle and Stock Returns. And because there are only 20 observed solar cycles, any results would suffer from the “law of small numbers” anyway. This entry was posted on August 25, 2014 at 12:11 pm	and is filed under Financial Astrology, Market Commentary. Tagged: lunar cycles. You can follow any responses to this entry through the RSS 2.0 feed. You can leave a response, or trackback from your own site.